The sustainability challenges of yesterday have become today’s resilience crises. National and global efforts have failed to stop climate change, transition from fossil fuels, and reduce inequality. We must now confront these and other increasingly complex problems by building resilience at the community level. But what does that mean in practice, and how can it be done in a way that’s effective and equitable? The Community Resilience Reader offers a new vision for creating resilience, through essays by leaders in such varied fields as science, policy, community building, and urban design. The Community Resilience Reader combines a fresh look at the challenges humanity faces in the 21st century, the essential tools of resilience science, and the wisdom of activists, scholars, and analysts working with community issues on the ground. It shows that resilience is a process, not a goal; how resilience requires learning to adapt but also preparing to transform; and that resilience starts and ends with the people living in a community. Despite the formidable challenges we face, The Community Resilience Reader shows that building strength and resilience at the community level is not only crucial, but possible. From Post Carbon Institute, the producers of the award-winning The Post Carbon Reader, The Community Resilience Reader is a valuable resource for students, community leaders, and concerned citizens. "A collection of works by a diverse stable of authors that seeks to illuminate the concept of resilience...The Community Resilience Reader is a valuable resource for thinking in a new way about almost every aspect of our communities." "Inspirational, aspirational, and grounded enough to be practical, The Community Resilience Reader: Essential Resources for an Era of Upheaval, edited by Daniel Lerch, is a useful text for planners who wish to strive for sustainability...For those planners who entered the profession to change the world, this book might reignite that passion. For students who are just discovering planning, this book might give hope that making the world a better place is still within our grasp." "The Post Carbon Institute does not disappoint with The Community Resilience Reader. The book offers a wealth of ideas and examples for building community resilience in all aspects of society. Post Carbon Institute offers views that may be considered radical to many—but that’s their approach, and I love it. I wholeheartedly believe my undergraduate students will greatly benefit from The Community Resilience Reader as I have." "Daniel Lerch and others have created a comprehensive, informative, and practical guidebook for advancing our transition into the Anthropocene. The authors address at once the foundational concepts of sustainability and resilience, while providing a call to action for communities worldwide to work together and prepare for the epoch transition upon us." "Daniel Lerch and the team at the Post Carbon Institute have done it again. This collection of authors digs deeply into the topics of global carrying capacity, economics, community, ecology, energy, and other resilience-related themes. Building on the success of the 2010 Post Carbon Reader and other publications produced by the Post Carbon Institute, this new book is a resource I will use in some of my advanced undergraduate courses. I will also recommend it to local decision makers who are trying to find ways to guide their own communities forward in a positive direction. Each chapter is nutrient dense and leads the reader to think deeply about our current operating procedures on planet earth and the need for profound change." "The Community Resilience Reader has not come a minute too soon. This is essential reading for college classes, local planning boards, conservation commissions, community activists, resilience study groups and anyone shaken by the environmental, energy, economic and equity crises now confronting humankind. Readers looking for ways to navigate the troubled waters ahead will find innovative, thoughtful, and wise guidance throughout these pages. This book reflects the paradigm shift so desperately needed from a system of unsustainable growth to one of resilience and reintegration with the natural world. Everything that needs to be done is doable—but only if humankind digs in to do the hard work ahead. 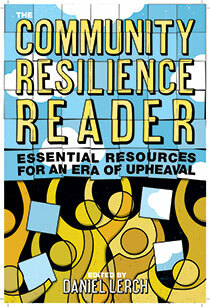 The Community Resilience Reader serves as a much needed guidepost." Chapter 6. The Roots of Our Crises: Does Human Nature Drive Us Toward Collapse? Click here for an annotated table of contents. Click here to download a free companion reader cultivated from articles from our Urban Resilience Project.